Workers furious at layoffs seize control of part of UNRWA Gaza headquarters, agency head says. Workers have seized partial control of the headquarters of the UN agency for Palestinian Arab refugees and their descendants in Hamas-run Gaza, its head said Wednesday, accusing their union of "mutiny" over job cuts. The United Nations Relief and Works Agency (UNRWA) announced last month more than 250 staff in Gaza and Judea and Samaria would lose their jobs, after a $300 million cut in annual funding from the United States. 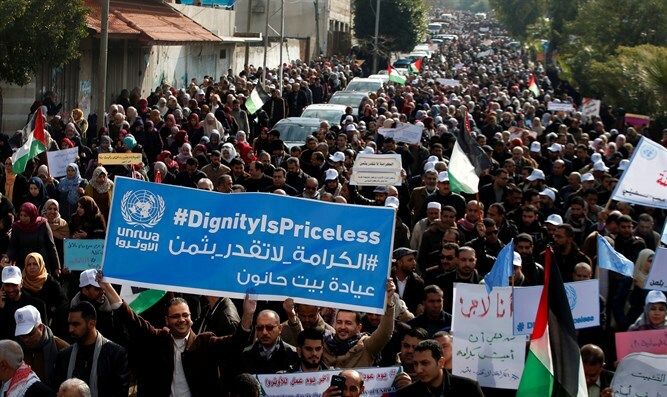 The redundancies have prompted daily protests by the agency's labour union in the enclave, which UNRWA's Gaza head said have led to security concerns. "They have taken over the compound where my office and other offices are," said Matthias Schmale. The agency's Gaza chief admitted UNRWA does not have full control over the site, in Gaza City, explaining he has not been able to access his own office for more than two weeks. "I am the captain of the ship which has 13,000 sailors on it and they have basically thrown me off the bridge and consigned me to my captain's quarters," he told AFP, referring to the number of employees in Gaza. Schmale accused the labor union of multiple incidents of "threatening and intimidating other fellow Palestinian staff. For me that crosses a red line." "I am very concerned about the safety and security of my Palestinian colleagues," he added. The union denied all allegations of intimidation and is due to continue demonstrating, with a general strike expected in the coming days unless a deal is reached. On Wednesday the UNRWA compound was visited by Mahmoud Zahar, a senior Hamas member, who pledged his Islamist movement's full support for protesters. "I didn't know that Mahmoud Zahar showed up but clearly political players are involved in this and are using this UNRWA crisis to more broadly address issues around the right to return, etc." UNRWA was established after the war surrounding Israel's creation in 1948 when around 700,000 Jordanian citizens fled the area, encouraged by their leaders' promise that the Jews would soon be defeated and they would be able to return home. Self-described 'Palestinian refugees' numbered 750,000 in the 1950s, but now - thanks to the unique and unprecedented expansion of the word "refugees" to include descendants and those who returned home - the number is claimed to be 5.3 million. In truth the number of actual refugees who fled in 1948 and are cared for by UNRWA is estimated to be a mere 20,000. In January US President Donald Trump froze a $125 million grant to UNRWA. Nearly 30% of UNRWA's funding comes from the US.